Pamosa now brings to you an organic based effective remedy for Arthritis! 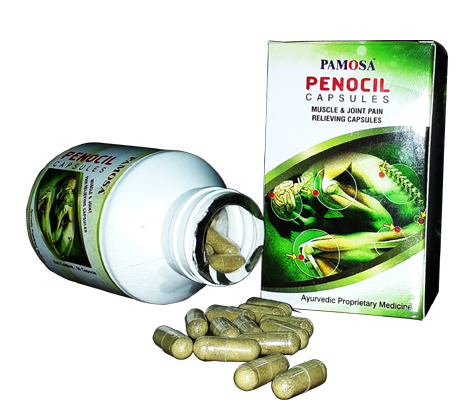 Penocil is the natural & effective answer to bring total relief from Arthritis. In today’s world Arthritis is widely found in all walks of life. Hence Ayurved has researched & is now ready to proudly offer you this product, to give you remedy from such torturous pain. 3) Intense pain & swelling in joints. 6) Burning sensation in hands & feet. To bring you relief from such torturous pain, arising from stiffness in joints & to improve the joints & muscles in our body, by reducing stress & worry...............we now bring you Penocil. This is an ideal pain reducing agent found in nature. It is very effective in reducing swelling/oedema in joints. Headache, joint pain, joint swelling & rheumatoid arthritis. It acts as an ideal pain / oedema reducer. It improves the overall function of the nervous system. It is useful in all types of arthritic disorders. It stimulates the central nervous system & acts like an anaesthetic agent. Because of its inbuilt soothing quality , it acts like a pain reliever. It heals internal wounds very easily. Acts like a pain healer. It is an ideal combination of medicine for all types of arthritic disorders. Hence useful in rheumatoid & osteo arthritis. It reduces pain & swelling in the joints. It stimulates strength to the bones / joints. Hence the crept effect in the bones is reduced. This reduces the pain in joints & improves the appetite & digestion.